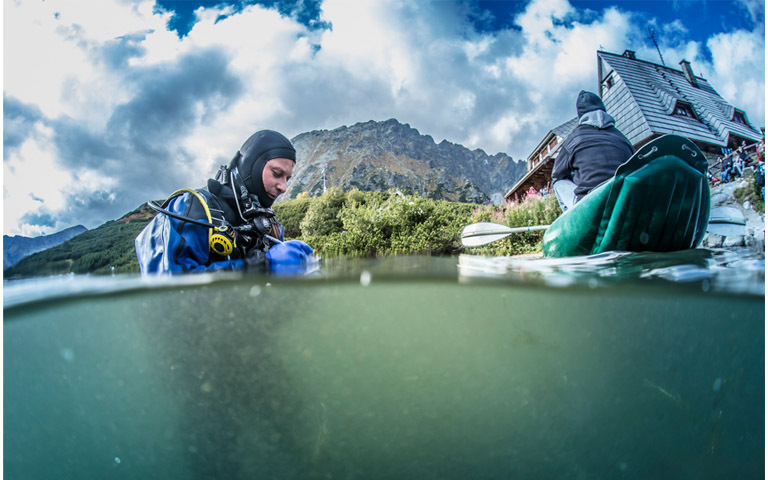 A research project concerning fish and plants living in the waters of the Tatra National Park which has been conducted since 2013 has now been completed. The first such comprehensive study in the history of TNP was conducted by scientists from the University of Warmia and Mazury: Dr. Jacek Kozłowski from the Department of Biology and Fish Breeding of the Faculty of Environmental Sciences, team leader; Dr. Eng. Krzysztof Kozłowski also from the Department of Biology and Fish Breeding and Dr. Eng. Anna Źróbek-Sokolnik and Dr. Eng. Piotr Dynowski from the Department of Botany and Nature Conservation at the Faculty of Biology and Biotechnology. These four scientists conducted research in Morskie Oko, Czarny Staw under Rysy and Dolina Pięciu Stawów. The purpose of the research was, among others, determining what species of fish live in the Tatra ponds and streams, the condition of the fish, what they eat and to what altitudes they inhabit the streams. Researchers also investigated the extent of the occurrence of aquatic plants. The obtained results will be used to develop maps of real aquatic vegetation and improve pond monitoring. - The research was difficult and impossible to do without the help of divers. That is why the research team included over 20 specially trained divers with underwater naturalist skills. They were prepared so that when going under water they would not disturb the balance of the ecosystem. The training was possible thanks to our cooperation with the Scientific Subcommittee of the Underwater Activities Committee of the Main Board of PTTK (National Polish Tourist Association). The extent of difficulty can be shown by the fact that Czarny Staw under Rysy is about 70 m deep, while the Morskie Oko is about 50 m deep and located at a high altitude. Descending so deep into the water requires special skills - explains Dr. Piotr Dynowski, who is also a diver and the author of the special training program. All Tatra ponds are of the alpine type. Therefore, they should be clean, without biogens and with a small amount of life. Unfortunately, it turns out that it is just the opposite. There is a lot of aquatic vegetation in Morskie Oko and it is increasing its range. Contributing to this is a large number of tourists visiting the most famous Polish mountain lake. - Sandwiches, plastic bottles and sunblock stains can be seen in the water. Algae blooms are appearing. The lake is degrading, it is becoming eutrophic - comments Dr. Dynowski. Czarny Staw under Rysy is still an alpine lake - scientists did not find plants or fish there. - In this tank, the water is the cleanest, practically distilled. We found a similar state of water in the ponds of Wole Oko and Zadnim (Dolina Pięciu Stawów) - adds Dr. Dynowski. The fish from the Tatra waters also came under close scrutiny of the Kortowo scientists. Researchers registered three species of fish: alpine bullhead, brook trout and riverine brown trout. The most numerous species turned out to be trout - it was found in the ponds, while in the streams bullheads were the most numerous. In Morskie Oko, trout were the most common, and trout were also found in three out of five ponds in Dolina Pięciu Stawów. While the aquatic vegetation in the Tatra ponds and streams is good, the condition of the fish leaves much to be desired. A shortage of food is to blame. - The fish are dwarfed, but they manage somehow. There is cannibalism among them, older individuals eat roe or alevin. We also observed, especially at Morskie Oko, that the trout learned to eat the remains of food thrown into the water by tourists. We even saw such "feeding" ourselves - says Dr. Dynowski. The Kortowo scientists were invited for scientific cooperation by representatives of the Tatra National Park. The research team was led by Dr. Jacek Kozłowski and he was also responsible for the fish section. Dr. Piotr Dynowski was responsible for the research covering vegetation. - Why was the research offered to us? Because our Faculty of Fishery is a very good brand in the scientific world. Our proprietary diver training project combined with biological research was also appreciated - explains Dr. Dynowski.